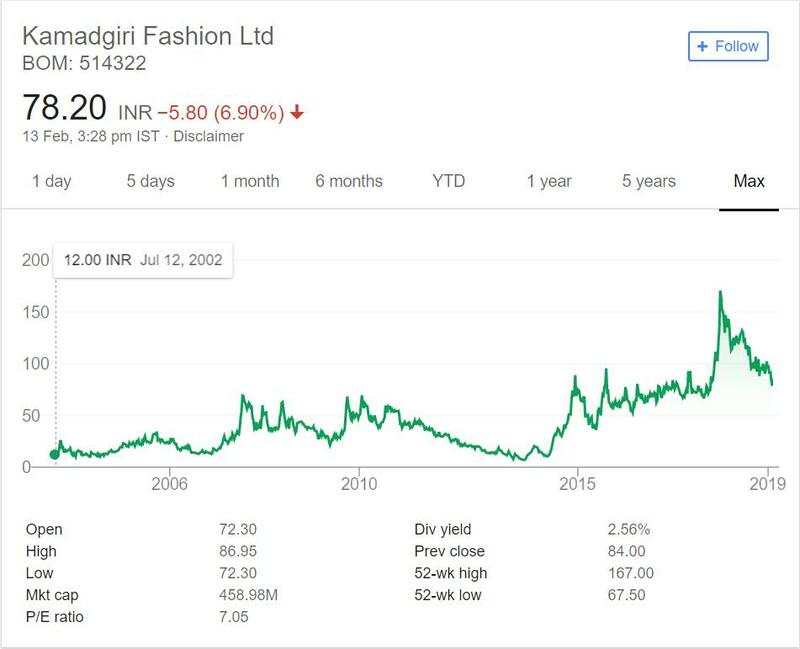 Kamadgiri Fashion Ltd. is in portfolio of Subramanian P. He is one of the top investors in India. The company belongs to Textiles sector. As per the Company website it has expanded vertically into Customized Weaving, Branded Fabrics, Apparels, Institutional & Uniform Supplies & Offering Gifting options of pre-packed fabric lengths for various occasions. It produces over 12 million meters of fabric and around 7 million pieces of garments every Year. The stock was trading at range of 12 INR in year 2002. It is trading at level of 80 as of now. So in these years it has given 6 times return. The stock journey can be divided into two parts 2002 to 2014 and 2014 to now. From year 2010 to 2014 it continually moved downwards and touched the initial price of 2002.This irregular price movements is cause of concern in investors. It moved drastically after the long debacle and gave stellar returns in last few years. The dividend yield at current market price is also very attractive for investors. Basically 2002 level investors are getting 14% dividend at current rate. Kamadgiri Fashion Limited is in Textiles sector. As mentioned in previous articles I am not too fond of this sector. It has its own share of problems and challenges. One being the presence of too many players in market. It has too many varieties as well. I would rather prefer not too invest in crowded sector. If any one is interested in this sector then they should tap on the established players. Those will have added advantage over the new players. Textile as a sector is evergreen sector and there will always be demand. Company which can turn brand into fashion statement can only make money in this type of market condition. (Recall Jockey brand display and the money Page Industries made).